Graphics objects are the components used by MATLAB® to create visualizations of data. Each object plays a specific role in the graphics display. For example, a line plot consists of a figure object, an axes object, and a chart line object. You can customize graphics objects by setting their properties. For more information about setting properties, see Access Property Values. Graphics objects are organized into a hierarchy, as shown in the following diagram. The hierarchical nature of graphics objects reflects the containment of objects by other objects. 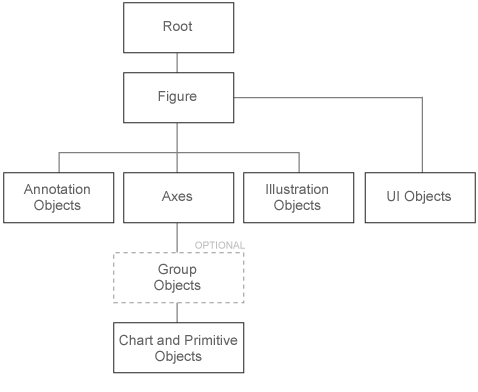 For more information, see Graphics Object Hierarchy.